Peel Place is located in the London Borough of Brent. 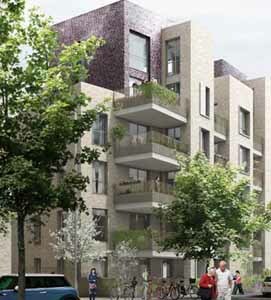 The site is part of the South Kilburn Regeneration Scheme. The development comprises a phased development with phase 1 comprising 38nr rented properties for Home Group. The project will be delivered using a section 106 affordable housing agreement between Home Group Limited and Countryside Properties UK. BPP is providing Employer’s Agent services. BPP is pleased to announce commencement of the project at Bastable Avenue for Estuary Housing Association. The project is the redevelopment of a brownfield site in Barking comprising the design and construction of 23 nr shared ownership dwellings with associated external works, drainage and services provision. BPP’s team is providing employer’s agent, cost consultancy and site inspector services on the project. Our new address is 150 Buckingham Palace Road, London SW1W 9TR. All other direct telephone lines and email addresses remain the same. BPP is pleased to announce completion of the project at Silver Quarter. Citystyle Homes, the private sales arm for One Housing Group has now launched for sale a collection of 55 shared ownership 1, 2 & 3 bedroom properties, each with private outside space. Silver Quarter is a part of the £3.7 billion Hallsville Quarter re-development of Canning Town and is very close to Canning Town Station. BPP is working with Home Group on a development consisting of a collection of traditional-style houses in a coastal location offering extensive green open space and attractive views of Walton Mere. The scheme comprises of 2, 3, and 4 bedroom flats and houses for private for sale. The project was procured via a development agreement. Kevin Frost, one of BPP’s senior associates, was involved with the drafting and agreement of the documentation. BPP’s team is providing employer’s agent, quantity surveyor and site inspector services on the project. Following the introduction of integrated Business Management System (BMS) to implement new ISO 2015 standards 9001 (Quality Management System) and 14001 (Environmental Management System), BPP is pleased to announce its certification for both standards. BPP is working with Home Group who is appointed to develop three phases of Channels, an exciting and ambitious new development which will contribute to the city council’s strategic economic growth plans for Chelmsford, with its newly classified city status. Home Group has developed an innovative design masterplan which will deliver a mix of high quality affordable rented, shared ownership and private-sale family homes set in a pleasant landscape reflecting the charm and heritage of rural Essex. Residents will enjoy excellent levels of energy efficiency as the whole scheme will meet standards 10% higher than required by current building regulations. They will benefit from warmer homes and lower energy bills thanks to exceptional insulation and features such as AAA boilers, mechanical ventilation and PV panels. BPP is working with JTP Architects on their project ‘Home for all Seasons’. In October 2016 JTP & The Environmental Design Studio (T-E-D-S) were the winners of the Sunday Times British Homes Awards ‘Resilient Home’ competition. The ‘Home for All Seasons’ incorporates all aspects of resilience from flooding to overheating, on-site energy production and the ability to adapt to social change, acting as an innovative yet viable solution to the housing crisis. BPP is providing quantity surveying services. BPP is pleased to announce completion of the project at Kenway, Southend-on-Sea SS2 5DX. Estuary Housing Association has now launched a collection 50 mixed tenure apartments. BPP’s team provided employer’s agent, quantity surveyor and site inspector services on the project. BPP is pleased to confirm appointment on the Home Group Consultants Framework for Employer’s Agent and Clerk of Works services. Home Group has ambitious plans to build up to 2000 mixed tenure homes per year nationally, with projects ranging from large scale mixed-use developments in towns and cities to smaller residential schemes in rural areas. Home Group delivers affordable homes and create mixed tenure residential developments that generate value and benefit local communities. BPP looks forward to working with Home Group on the above initiative.